I've never been a bad swimmer thanks to years of swimming as a child. My 1500m time is around 35 mins which I've always been okay with. Of course it could be faster but it's never bothered me at all. But if I'm thinking about Ironman, I'd like for that 2.4 mile swim (3.8km) to be around the 1 hour 10 ish mark.That's quite a chunk to knock off. So first thing's first, find someone to help me get faster! If you watched my Vlog 4 you'll know that I met an Ironman World Champ finisher (swoon!) and reached out to him for some advice. I've been going to his swim session on Sunday mornings from 7.30-9.30...god only knows why it has to be at this time!! It's been good but jeeze it's hard. I didn't realise how much swimming with other people would push me. I've been working harder than I've worked in a long time and my competitive nature is going wild! It's nice doing things I wouldn't do on m own and tying drills I've never heard of. Not to mention the fact having someone swim right up behind you in a lane will push you harder than you ever push yourself. They are also very encouraging which I find is such a rare quality in some triathlon people. Everyone is so competitive that's it's really nice to hear people pushing you on and telling you what you did right rather just than where's you're going wrong. 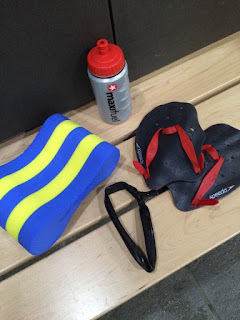 It's something I would really really recommend to anyone who wants to improve their swim. It can be so daunting at first with so many questions running through your mind "will I be the slowest? What if I can't keep up? Will anyone speak to me" - seriously I was worried no one would be nice to me. Everyone has the same worries, everyone was a beginner once. All I can say is think about how much better off you'll be for going and focus on that. And you won't know unless you try, even if you just go one time!